Already own a home in the River Mill subdivision? Thinking of selling? Click here and read about current search trends & our web network. River Mill homes for sale in Fairhope, AL are all listed on this page. Along with current property listings, are maps, pictures, property details and other useful info for homes for sale in the River Mill subdivision in Fairhope Alabama. The homes in River Mill are located just North of the Quail Creek golf course and just East of highway 181. 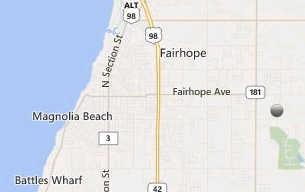 The River Mill homes are approximately 4 miles East of Mobile Bay, the Fairhope pier and the downtown area. The subdivision is close to a variety of local shopping boutiques, restaurants and entertainment venues making River Mill a great, centrally located neighborhood. The Gulf Shores beaches and approximately 40 minutes from the homes in River Mill. Please let us know if you would like further info River Mill or any other homes, condos or real estate in the area or would like to schedule a private viewing by emailing info@condoinvestment.com or by calling 251-Area-Pro (251-273-2776) for immediate assistance.